This spring, GSA Network will honor the activism and leadership of API trans and queer young people who are organizing and advocating for racial and gender justice in their schools and communities. The Liberate! Award, formerly the Skylar Lee Leadership and Activism Award, will provide a $1,000 award to support the local efforts of API TQ youth leaders. 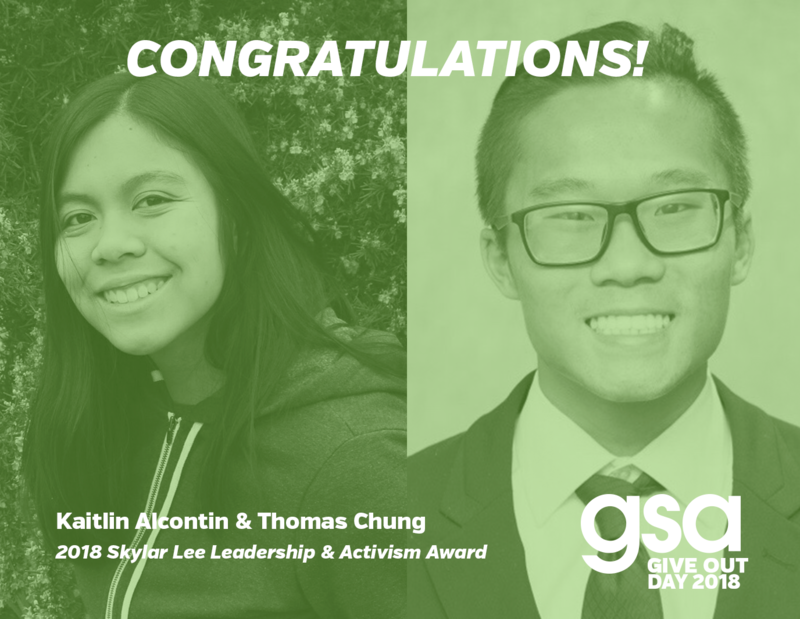 Read how previous winners Kaitlin Alcontin and Thomas Chung–who shared their story and helped fundraise for the Liberate! Award on Give OUT Day 2018 — kept the momentum going over the past year. Kaitlin Alcontin felt as if her queer and Filipina identities were at odds with each other. It seemed like she needed to pick one identity to move through the world and navigate organizing spaces. In 2018, Kaitlin received GSA Network’s Liberate! Award (formerly the Skylar Lee Leadership and Activism Award), and it changed her perspective entirely. Those two seemingly-conflicting identities were validated and her understanding of intersectional leadership was strengthened. As a member of her high school’s GSA in Alameda, CA, Kaitlin had already developed activism chops by fighting for LGBTQ+ student equity and inclusion in the classroom. But the award – and the $1,000 prize – opened up new doors for her. Kaitlin attended the National Queer Asian Pacific Islander Alliance (NQAPIA) National Conference, where she connected with other students who shared her identities and was set on a path to become the co-chair of the Asian Pacific Coalition’s LGBTQ programming at UCLA. As a freshman at UCLA, she’s already facilitated a training on avoiding microaggressions in activist spaces and organized a trip to the Golden Dragon Parade in Los Angeles with the goal of boosting queer representation in the Lunar New Year celebration. Though he was initially hesitant about throwing his hat in the ring, high school senior and former winner Thomas Chung has leveraged the award to advance trans and queer organizing in his school. “I didn’t think I was doing anything important in the work I was doing,” he says. With a little encouragement, he began to view the award as a means to motivate himself to continue organizing and think big about how he could help his community. Betting on himself–and his activism–paid off. With the grand prize, Thomas has offered financial support to his GSA club, choosing to buy supplies and supplement the club’s fundraising efforts. He also wants to use some of the prize money to throw a gender neutral or non-binary fashion show fundraiser, which would be open to his school and other GSAs nearby. Thomas attended GSA Activist Camp in 2018, continues to be active in GSA organizing spaces, and intends to keep organizing after graduation. In February, Thomas published a provocative piece in Teen Vogue on How Queer Young People Can Change the World Through Activism. Bold Voice. Reclaimed Power. A Chance To Give.